Robert Leath, Chief Curator & Vice President, oversees the collections, library and research initiatives of the Museum of Early Southern Decorative Arts, plus the collections at the historic sites of Old Salem. Previously, he was Curator of Historic Interiors at Colonial Williamsburg Foundation, creating and implementing the furnishing plans for fourteen historic sites. From 1999 to 2000, he was Curator of Collections & Restoration for Historic Kenmore Plantation. 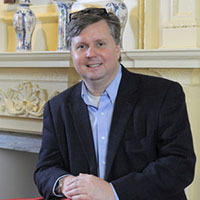 As Assistant Curator for Historic Charleston Foundation from 1991 to 1999, he coordinated the restoration and refurnishing of the Nathaniel Russell House. Mr. Leath advises on historic furnishings at James Madison’s Montpelier and Stratford Hall Plantation. He lectures widely and his articles have been published in American Furniture and The Magazine ANTIQUES. He serves on the American Furniture Editorial Advisory Board, on the Advisory Board of the Charleston Heritage Symposium, as well as their Moderator and Curator-in-Residence, and as an advisor to the New Orleans Antiques Forum. Mr. Leath studied political science at Guilford College and the University of North Carolina at Chapel Hill. He also attended the MESDA Summer Institute, the Attingham Summer School and Attingham study tours of Devon and Cornwall, the Netherlands and the Veneto.